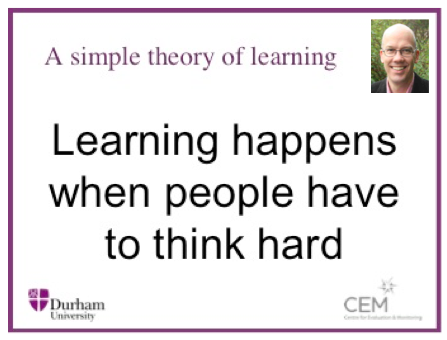 If learning happens when we are made to think hard. If learning happens over a period of weeks, months and years. 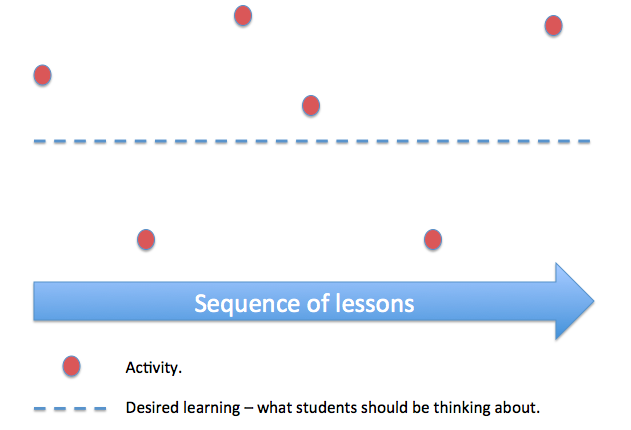 Is lesson planing always carried out with student learning in mind? Recently I have led a series of talks/sessions/workshops on the challenges of leading teaching & learning across a school. What has struck me as somewhat odd is the number of people that hear the phrase ‘teaching & learning’ but only really register the ‘teaching’ part. Teaching without any understanding of how people learn or what learning is, conjures up thoughts of the blind leading the blind. What does your school focus on? 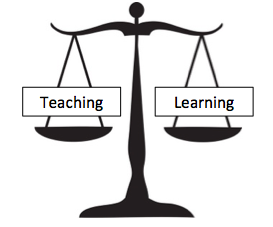 Is their balance between teaching and learning with links between the two? What does your school focus on? 1. What is the desired learning outcome? 2. What do I want students to think about at different points during the lesson? 3. Will the activity make them think hard about the desired content or distract them from it? 4. How will I link new knowledge to students existing knowledge base? 5. How will I model the learning outcome? What I think about when I plan a lesson. So I think about the one thing I want my students to learn and then design a sequence that will enable them to think hard about the knowledge and apply / practice the desired skills. If an activity does not contribute to the learning then it doesn’t form part of the lesson. The spectrum below (created by Shaun Allison) expertly depicts what teachers should be aiming for – the struggle zone. Learning should be difficult enough that students grapple with the content but not so difficult that it flies straight over their heads or so easy that it doesn’t require any real thought at all. 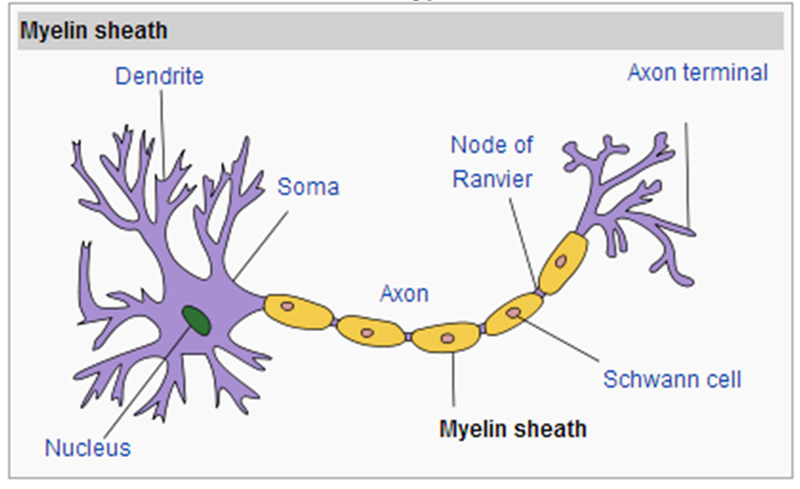 What is the quickest path to the learning? On a recent trip to Malaysia (so recent I’m currently sat in my wife’s parents house in Malaysia writing this post) me and my wife decided to fly direct from London to Kuala Lumpur, with a 3 month old in tow it seemed like a sensible idea. Our objective was to get to Malaysia as quickly as possible with the least amount of hassle and distraction. Now we could have flown from London to Amsterdam, wait a few hours flown to Dubai, wait several hours before flying onto Kuala Lumpur which would have used up almost a whole day on travelling. This option might have saved us a little money but would have almost certainly used up lots of time and energy. This scenario made me think about lessons and the quickest possible route to learning. 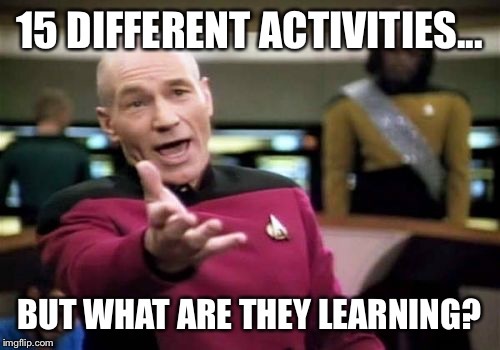 I’ve observed a number of lessons where the objective has been really clear on the learning that the teacher wants the students to engage with, but the students have been held back by a flurry of activities with questionable links to the desired learning. This leads me to think that as teachers, if there is a direct route to the learning we should take it. When planning a lesson, if the objective is for students to learn X why should they embark upon an array of activities that eventually lead them to X or miss the destination altogether? We sometimes get bogged down in planning lessons to fill time using multiple activities (that sometimes take us off course) to buffer the learning rather than getting straight to the learning. 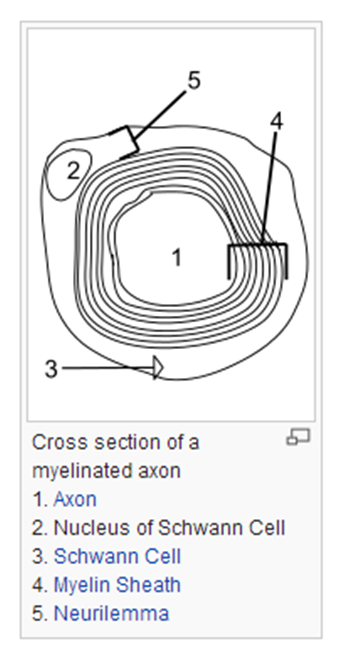 Consider the two diagrams below – which one best represents your lessons? A sequence of lessons that provide a buffer to learning. A sequence of lessons focused around the desired learning. 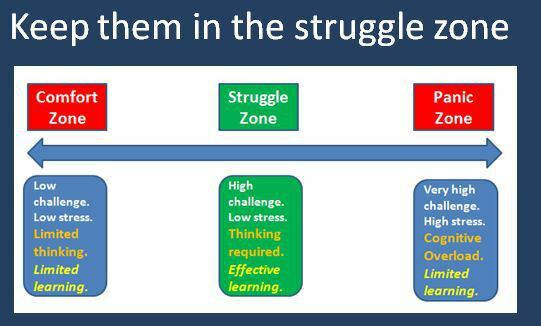 When planning a lesson it’s important to keep in mind the learning and design activities that will enable students to think hard about the desired learning by spending time in the struggle zone and allow time for students to practice the application of desired knowledge / skills. 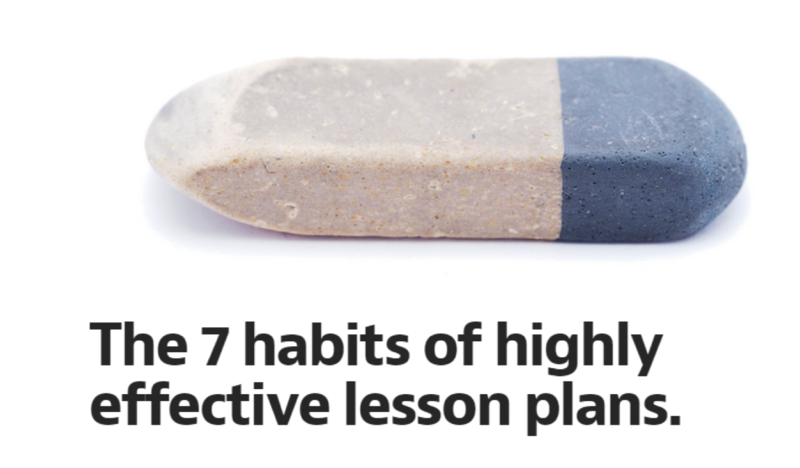 Habits of highly effective lesson planning. This blog post by Pepe Mccrea outlines habits of highly effective planning. Below are the 7 habits with a few key extracts from Pepe’s blog. 1. Start with the end in mind. Excessive clarity – The clearer you are about where you want them to get, the better you’ll be able to help them get there. 2. Take the shortest path. Don’t waste time designing overly complex learning experiences. What is the least I need to say to explain this concept to my students? What is the least amount of information I need to give them before they can get started? 3. Assess reliably and efficiently. Hinge questioning Asking the whole class to: answer a multi-choice question using hand-signals; or show their thinking using mini-whiteboards. Exit ticketing Giving students 3 questions to answer on a sheet of paper which they have to hand to you as they walk out the door. 4. Build learning that lasts. Plan for thinking As Daniel Willingham so eloquently puts it, ‘learning is the residue of thought’. Plan what you want your students to think. Anchor thinking David Ausubel tells us that ‘what students already know is the most important factor in what they can learn’. Design activities to help your students tap into what they know and make connections with what they’re going to learn about. Increase your impact further by looking for points in your lesson where students are likely to struggle, make mistakes or develop misconceptions. 6. Move towards inter-lesson planning. The relationship between lessons is just as important as what happens within them. Sharing your planning and practice not only brings fresh eyes to old problems and helps us articulate what we’re doing and why, but it also spreads our understanding of what works (and what doesn’t) amongst our profession. – working backwards from where you want students to end up. – what you want students to think about at different points in the lesson and how your planned activities will foster that thinking. If learning occurs over long periods of time. If teaching is led by an individuals’ beliefs and values. If effective teaching is hard to agree on and to a large extent determined by outcomes (but not entirely). Is it right to persist with inferring judgments on teachers and lessons? It seems we’re trying desperately to measure something that is very difficult to quantify (if not impossible). 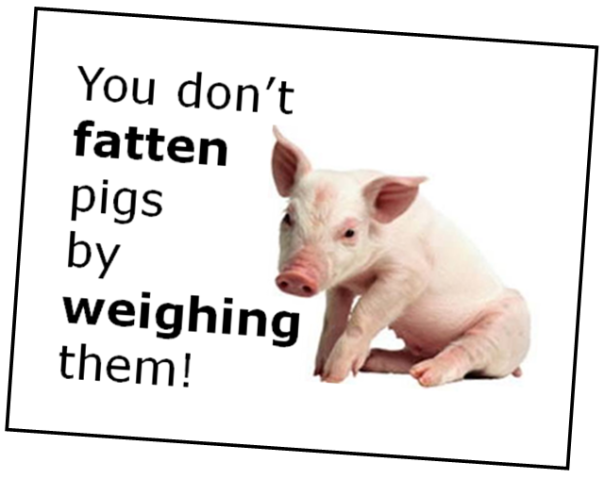 “Weighing a pig doesn’t make it fatter” a colleague of mine said recently when discussing the grading of lessons. Does the grading of lessons actually detract from genuine, deliberate improvement? 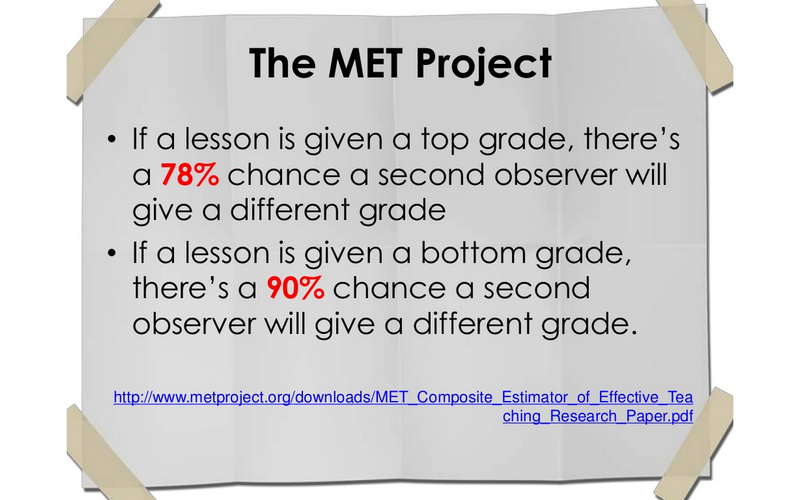 This made me consider an over arching question – what is the purpose of lesson observations? Are they to judge or are they to offer support and help develop teachers? Is it possible to do both? In my experience I’m not sure that it is. The problems with grading lessons. The main problem with trying to judge a lesson is that it’s hard to agree on exactly what great teaching is and in the moment of an observation it’s impossible to know what the learning gains for the students will be as a result of that lesson. If learning is invisible and it happens over long periods of time then perhaps all we can see in lessons is performance rather than learning and as Professor Coe points out, this generates lots of poor proxies for learning that we quite often use to grade lessons and assume learning is taking place. If we consider Professor Coe’s ‘Poor proxies for learning’ is it possible to truly know whether a lesson is likely to produce good outcomes from a 20 minute observation? It’s easier to check for evidence of a schools ‘list of non-negotiables’ in lessons – have books been marked, is homework being set, learning objectives, e.t.c. This is made possible by their prescriptive nature. But can observers accurately predict outcomes based on this and the conditions in the classroom? We know that a calm, quiet classroom does not necessarily indicate that learning is taking place, however it quite often gets used as a proxy for learning during observations. 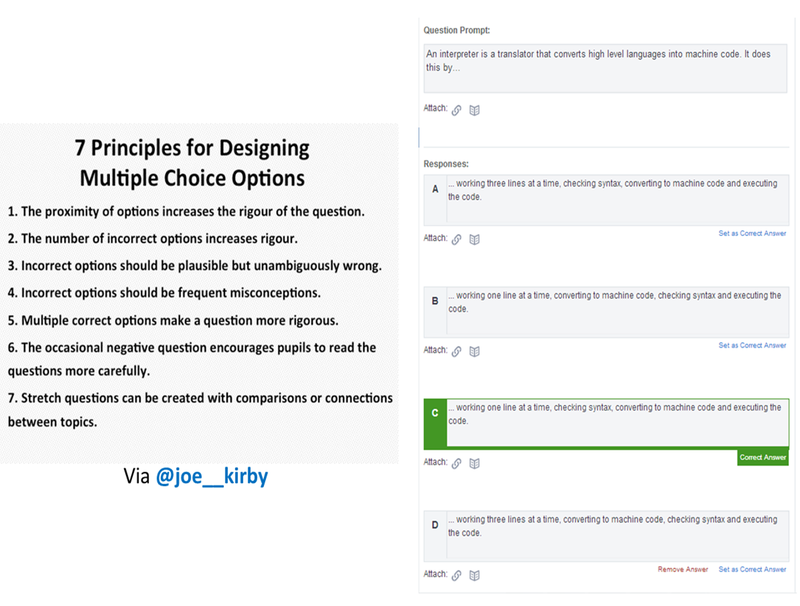 Which leads to this question…How many lessons that are judged to be ‘outstanding’ produce truly outstanding outcomes? The day the soldiers stop bringing you their problems is the day you stopped leading them. They have either lost confidence that you can help them or concluded that you do not care. Either case is a failure of leadership. As a senior leader how well do you know your teachers? How often are you in and out of lessons? As a senior leader when was the last time a member of staff came to you for help regarding a tough class? In a thriving school that genuinely prioritises the improvement of teaching, shouldn’t this be fairly common? As a senior leader, how much of your time is spent in lessons speaking to students about their learning, getting a feel for typicality of teaching across the school? This should be a daily ritual, part of your core business. As a senior leader how much time have you spent with the teachers who consistently get great results? What have you learnt from them? Has this been shared? If teaching is the most important factor in achieving great outcomes for young people, do we really spend enough time trying to genuinely improve it? Does a graded system help create a culture of improvement or distract from it? Does a graded system inspire teachers to improve or does it burden them with unnecessary stress? Does a graded system sharpen the focus of improvement or blur it beyond recognition? It’s very difficult (if not impossible) to agree on a list of prescriptive teaching strategies (and Ofsted don’t presbive any methods of teaching) but it’s easier to agree on elements of great teaching. 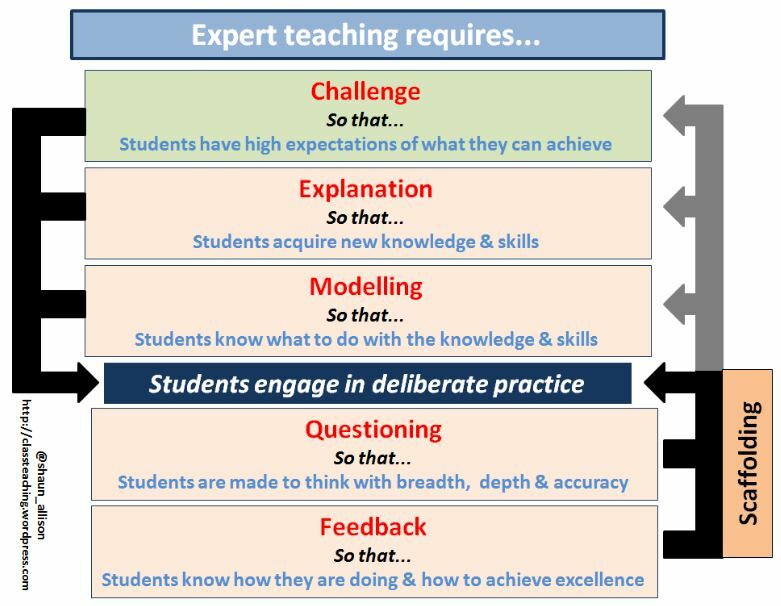 When I think about elements of great teaching I tend to look no further than Shaun Allison’s fantastic model. Whenever I revisit this model I find it difficult to tweak or change it. When I share it with colleagues it just seems to make sense to both them and me. How teachers go about implementing the above model into their lessons / series of lessons should be down to them. What this model looks like in a series of drama lessons it probably different to what it may look like in a series of maths lessons (however that does not mean that are things that cannot be learnt from observing both). Teachers should be trusted as the professionals that they are to do what’s best for the students. The danger of moving away from a graded lesson observation system for some schools is that it could invite mediocrity, as most graded systems bring with them a very prescriptive set of teaching strategies. In some cases where schools are in need of improvement putting in a prescriptive structure can be the first step towards improvement – tighten up for good, loosen for outstanding. Tightening up will only take you so far. Grading lessons can show a direction of travel for improving teaching (as Dr Dan Nicholls explains here) but it also comes with excess baggage which can slow down the speed of travel. Perhaps a simple ‘secure’ or ‘developing’ may provided a stepping stone to merging the two schools of thought on grading lessons, e.g. “From the evidence collected in the lesson the questioning observed appears secure because… Further evidence from talking to the students suggests…” However this opens the flood gates of subjectivity, which can be curbed with prescription and eventually takes back to square one. What if instead of trying to judge the teachers / lessons we adopted an approach where observers go into lessons to learn. 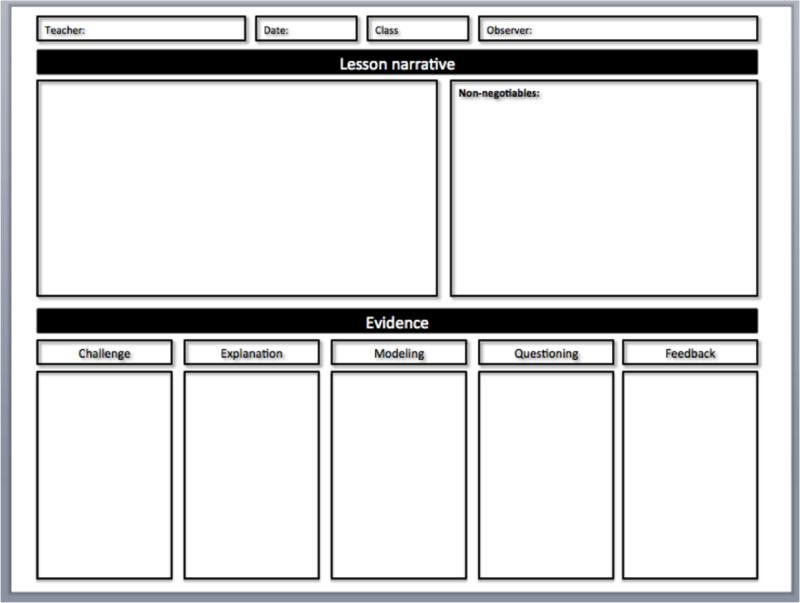 This could take the form of observers going into lessons to collate evidence for teachers (perhaps under the headings of Shaun’s expert teaching model above) with a view of feeding this evidence back to them, similar to a lesson study approach. Build a picture of what appears to happening in the classroom (feeding the pig) rather than making a judgement (weighing the pig). Evidence could come from questioning students about their learning, looking at student work, observing how students / teacher interact with each other as well as assessment data provided by the teacher. What if observers gave live feedback to teachers based on their observations during the lesson instead of waiting hours, days or even weeks to feedback. Here’s an example. A lesson is underway and the observer is watching as the teacher delivers an explanation of a key concept using a subject specific key term. 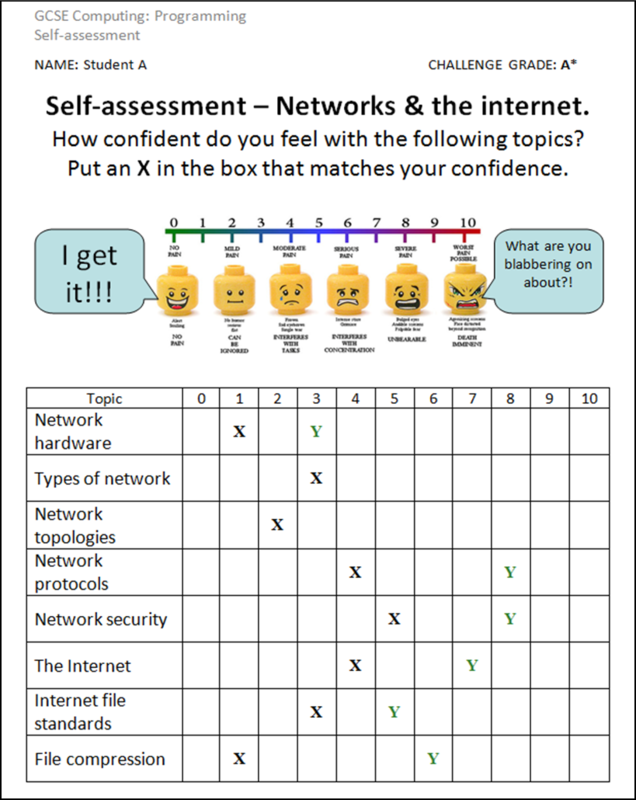 After the explanation the observer spends a few minutes questioning the students to gauge their understanding of the task they have been given and the key term being used by the teacher. Out of the several students that have been questioned by the observer they are all able to explain the task (what they have to do) but none are unable to articulate what the key term means. Using live feedback (rather than waiting for the follow up feedback session) the observer is able to give feedback to the teacher straight away who is then able to help move the students forward with their understanding of the key term. In the follow up meeting the teacher explains that they had been using the key term for a few lessons and despite explaining the meaning in the first lesson they had failed to continually reiterate the meaning of the key term through the series of lessons. Together the observer and teacher are able to collaboratively come up with a simple strategy of asking students to repeat back definitions of key terms during lessons and the teacher was set the target to make this habit across all their lessons. This also served as a timely reminder for the observer to continue to develop across their lessons. At a department team meeting later that week the teacher is able to feedback their experience to colleagues. Collated evidence + clear collaborative target = genuine improvement(?). Not only did this experience serve as a timely reminder for the observers own teaching but the other teacher involved had a small step to implement and experience some immediate success. The observer followed this up with another supportive observation where they the teachers new habit developing in real time and it allowed the observer to collate further evidence of what was happening in the classroom, for the teacher. How might this process had gone if I had graded the lesson? I think the point here is that there is no need to grade the lesson at all – making the simple more complex for no additional gain. All the teacher needed to know was what was happening in the lesson – what did the observer notice that perhaps the teacher did not? What are the next steps to improve? In hindsight (my confirmation bias may be at warp factor 10 here), but I think a grade being given in the example explained above could have diluted the feedback and perhaps stifled the motivation for improvement. Collating evidence in the classroom. Chris Moyse has already started some great work on evidence based lesson observations – read about it here. The idea revolves around going into lessons to learn and help teachers see things that they may not notice during a lesson – very similar to the lesson study approach. 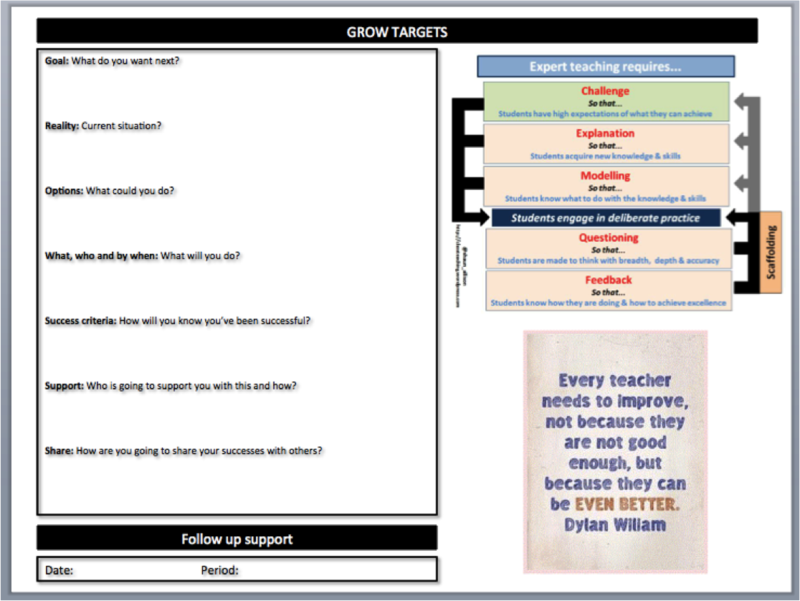 I’ve started to develop a document (in its first draft – feedback welcome) to collate this adopting the principles of great teaching from Shaun Allison’s model. Front page of draft evidence based observation form. Back page of draft evidence based observation form. 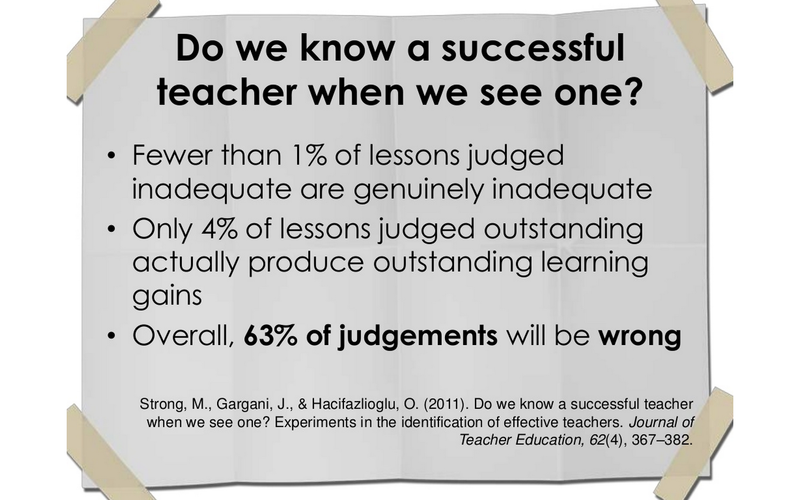 Judging the quality of teaching. If we really need to assign numbers to teachers, based on a 30 minute observation, to know about the quality of their teaching, then we are doing something really wrong. 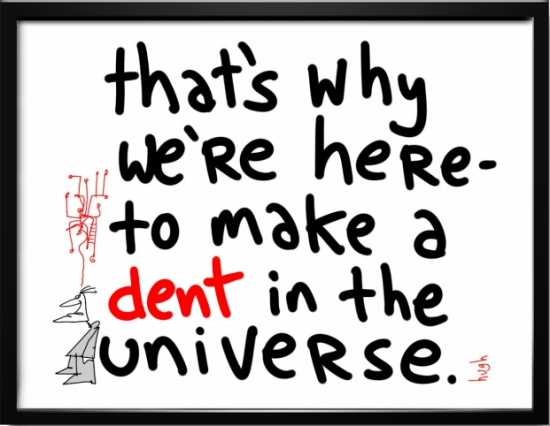 We still know our teachers inside out – we know who the really great ones are, and who are the ones who need that extra support with a particular aspect of their work. Without the need for numbers. We know this by looking at their student outcomes, as well as by looking at and discussing their lessons, the feedback that they give to students and the work that their students produce during lessons and at home. We know our staff. In order to genuinely improve teaching we need to stay focused on the main thing – the quality of teaching. We need to focus on how it can be improved and not allow anything to dilute or blur supportive feedback. We need to remember that teachers are people and that our best chance of improving the outcomes of students is to support and challenge colleagues through a trusted relationship built upon collaboration and a relentless desire to learn. Grading individual lessons is difficult, unreliable and time consuming which often results in little actual improvement. Grading individual lessons does not always speak to the person, diluting and blurring the focus of improvement. How can lesson observations be used to improve teaching (feeding the pig rather than weighing it)? 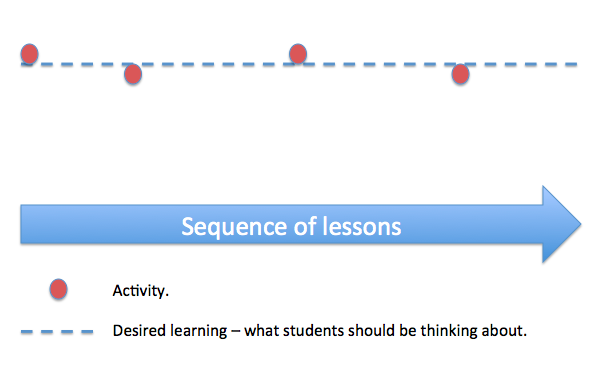 Live feedback during observations – why wait for a feedback session if it could help students in the moment. Collation of a variety of evidence including student voice, assessment data, work in books, e.t.c. to give teachers further insight into their lessons. Continuity – SLT take joint ownership of improving the quality of teaching with middle leaders through daily time spent in classrooms. Time spent here could reduce the need for additional learning walks. More questions have been asked than answered in this post but I hope it has provided some questions to consider when attempting to improve the quality of teaching through observing lessons. I intend to follow this post up with a more strategic plan of how the points in this post would manifest themselves in school (the logistics) and potentially replace a graded observation system. Sutton Trust Report 2014 coverage. This post aims to collate news coverage and blog posts about the recently published Sutton trust report into what makes great teaching. Prof Coe on Sky News after the report had been published. Professor Coe’s presentation – What makes great teaching? YouTube playlist of Prof Coe speaking at ResearchED conference. The problem with praise. By Richard Bailey. What makes great teaching. By Huntington School T&L blog. The Sutton Trust report – Great teaching? By Donal O’Mahony. In search of praise in PE. By @ImSporticus. Our checklist for great teaching – How does it fit with the Sutton Trust report? By John Smith. CLICK HERE to download an A3 summary of the Sutton Trust report to share with colleagues. #TMCOOP presentation – Raising attainment at KS4. 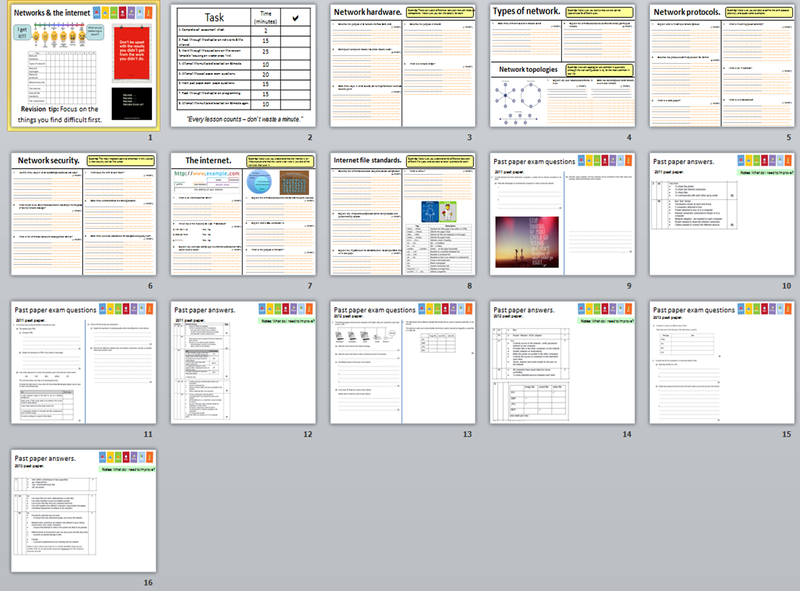 On Thursday 22nd May I presented some ideas at #TMCOOP about how to raise attainment at KS4. Below is a summary of my presentation. I’ve noticed in my relatively short time of being a teacher that one of the overwhelmingly strongest indicators of how well a student achieves is effort. This may sound obvious. It is. Angela Duckworth discovered this in her research on GRIT (persistant effort towards a long term goal). If we want to do well at something that’s difficult it will require a huge amount of effort. How often do students not realise this until it is too late… “I wish I’d put more effort into revising.” When I look back over the past few years and analyse why some students have performed well at KS4 and some didn’t, the main differentiator is effort. During last two terms I have attempted to build an ‘ethic of excellence’ in my classroom. I want all students to aspire to achieve the very top grades and I want them to know it will take a huge amount effort. I also want them to know that I will match their effort by supporting them through rigorous marking and feedback. Students aren’t always the best at following instructions from adults but they can be extremely good at mimicking behaviours. 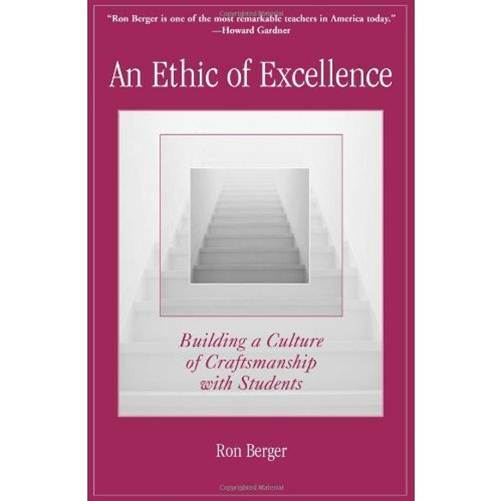 Having read Ron Berger’s remarkable book ‘An Ethic of Excellence’ I was motivated to get my students working their socks off. In the book Berger talks about how he spends a lot of time ensuring that the work he asks his students to do is as close to a ‘real life’ as possible. He also discusses how he built a culture in his classroom whereby students only received one of two grades for their work – ‘Excellent’ or ‘Not finished yet.’ What a powerful system. I decided to give it a try with a GCSE class that were about to start a 10 week coursework project. 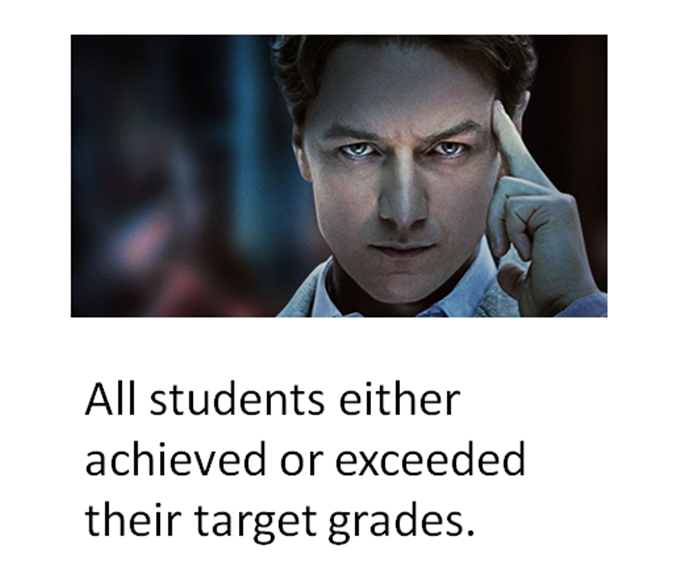 Target grades ranged from A to E.
Do target grades have an adverse effect on effort? 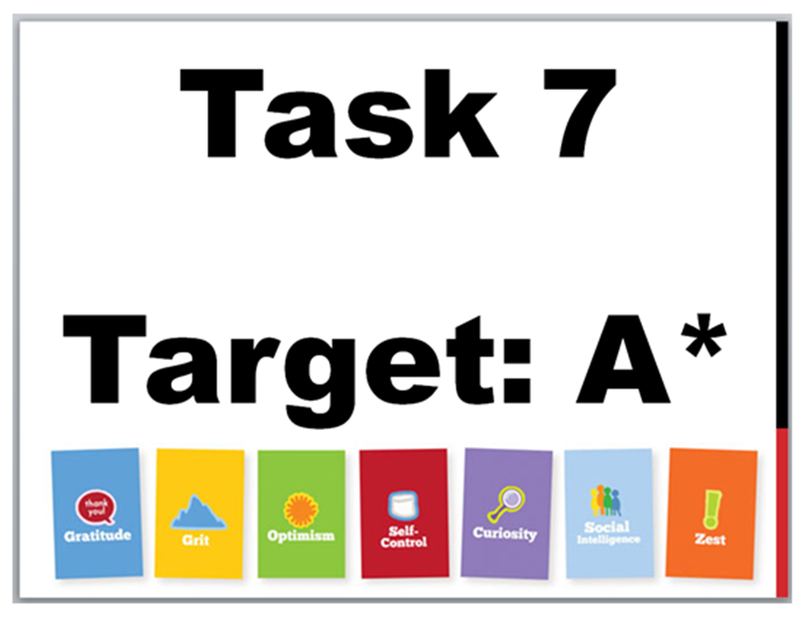 If a student is targeted a D/E grade, is it possible that they might see that as an opportunity to adjust their effort to reflect the low target, i.e. not try very hard. To test this hypothesis I started by setting a default expectation of all students in the class: A*. Was I confident that all students would achieve this? Realistically, probably not as there are many factors out of my control (attendance being one of them). But I was confident that this strategy would help everyone achieve or exceed their target grade (something that I hadn’t managed to do in the past). I spent sometime explaining to students about the David Beckham’s and Jonny Wilkinson’s of this world and how much effort they put into practising. 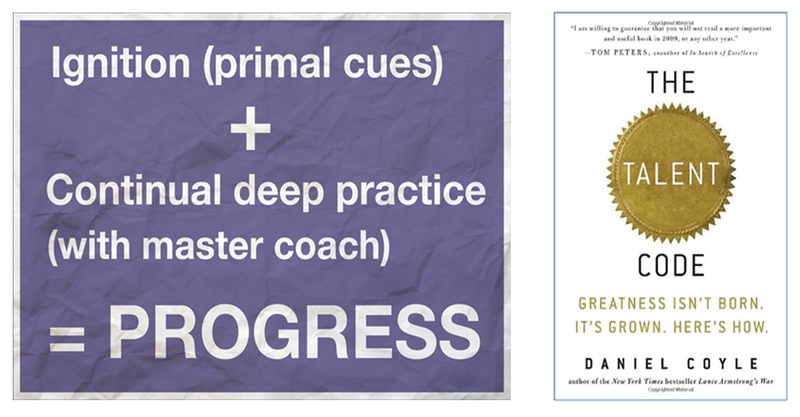 At the beginning of most lessons we would watch a short clip that actively demonstrated how high levels of effort matched with deliberate practice can lead to very impressive results. 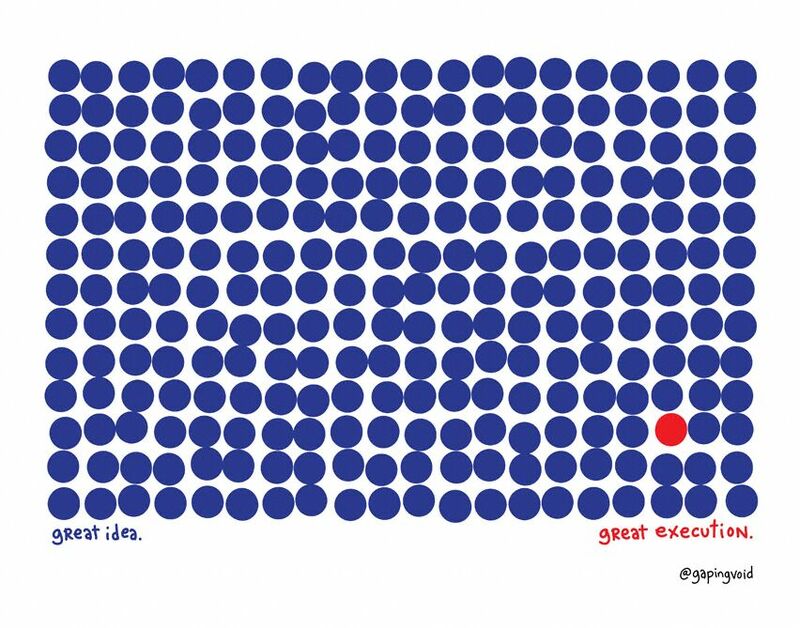 I found the work of Daniel Coyle (and his book ‘The Talent Code’) particularly helpful in shaping my thinking around this. In his book, Coyle explains how he spent almost two years scouring the world researching groups of talented people – from teenage Brazilian football players to young musical prodigies. A recurring theme was shared amongst all these successful groups. 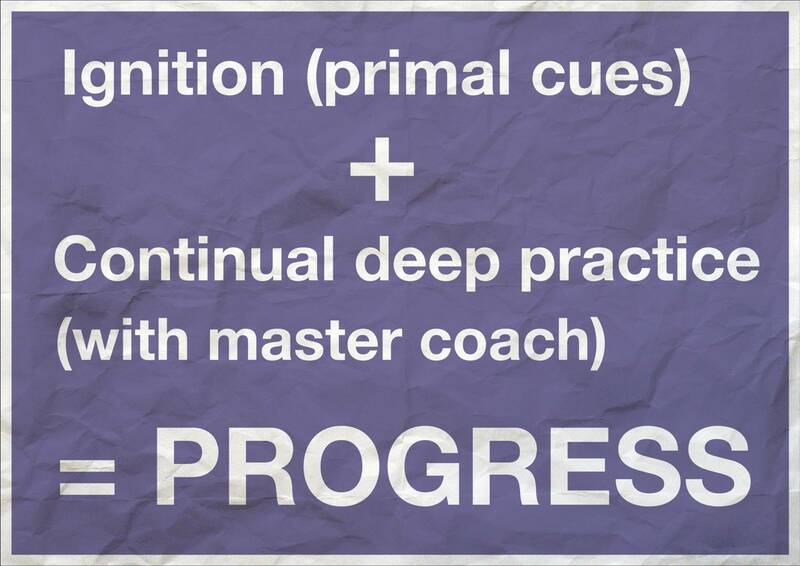 Lots of effort coupled with deliberate practice that was guided by a master coach. Students were beginning to understand that the more effort they put in, the more they asked for my advice, the more they thought about their work the better the chance they had at achieving an A*. This is where the effort manifested itself in the classroom. 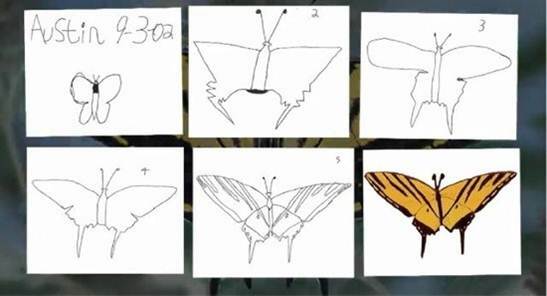 I introduced Berger’s idea of grading work as either ‘Excellent’ or ‘Not finished yet.’ Berger describes the art of re-drafting brilliantly in the video ‘Austin’s butterfly’ which is about a young boy who is asked to draw a butterfly by copying a photograph. You can see the difference in quality from the first attempt to the final attempt. I attempted to build a culture in the classroom where it was typicality that all students would re-draft their work. Students were asked to re-draft their work several times which often led to a small incremental increase in marks between drafts but a huge difference by the time the final draft was submitted. Students also learnt to take a bit more pride in their work which appeared to come about because they had put so much effort into the redrafting that when it came time to submit a final copy they wanted it to be as close to perfect as possible. The re-drafting was helped along by precise feedback in which I gave no grades. Instead I opted to simply tell students how many marks they were away from an A*. 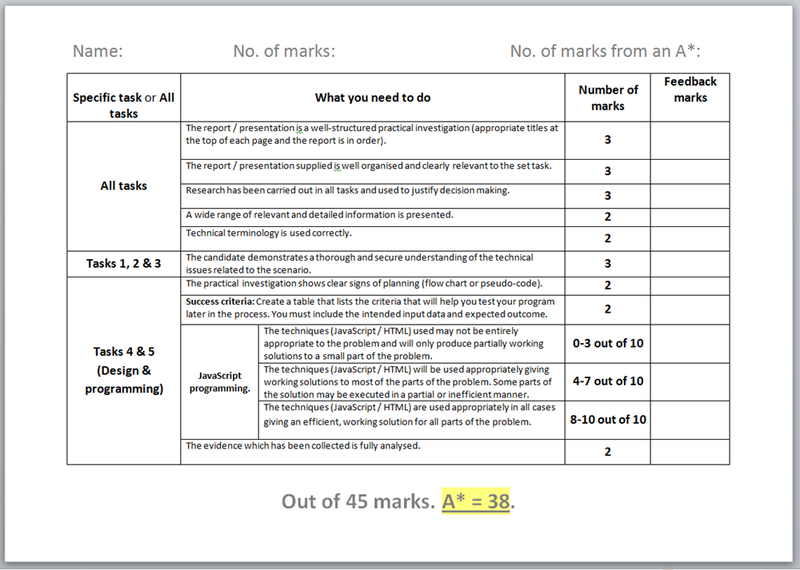 I then broke the mark scheme down into very small specific chunks which when added up would give full marks. This helped me move away from phrases like “Explain more” and enabled me to give really precise feedback to students. If a student was 15 marks from an A* they were able to tangibly see where they could add those marks to their work. With a potential A* on the line they were happy to continue to re-draft. I’d like to say a class full of A* grades but that was not the case. However all students did either achieve or exceed their target grade with no student scoring below a C and four students securing an A*. It wasn’t just the grades that pleased me but also the students attitudes towards their work. In class they were more focused and keen to give me work to mark. The students were proud of what they had achieved and I was extremely proud of them. What I have described in this post is by no means an exact science and I’m certainly not telling you to change what you’re doing, but this worked for these students. 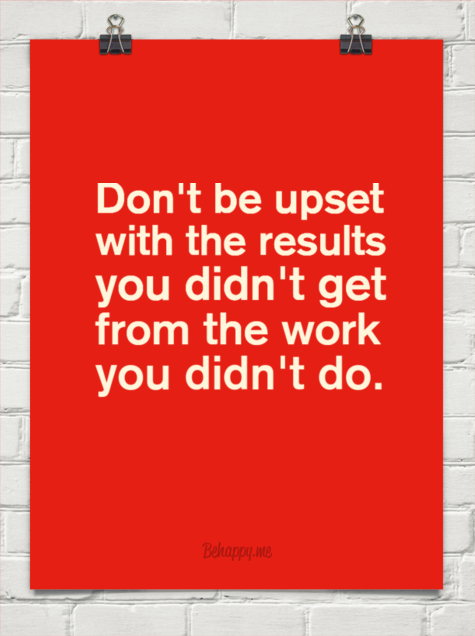 And remember… “Don’t be upset with the results you didn’t get from the work you didn’t do.” I think this applies to us all. This is a work in progress. 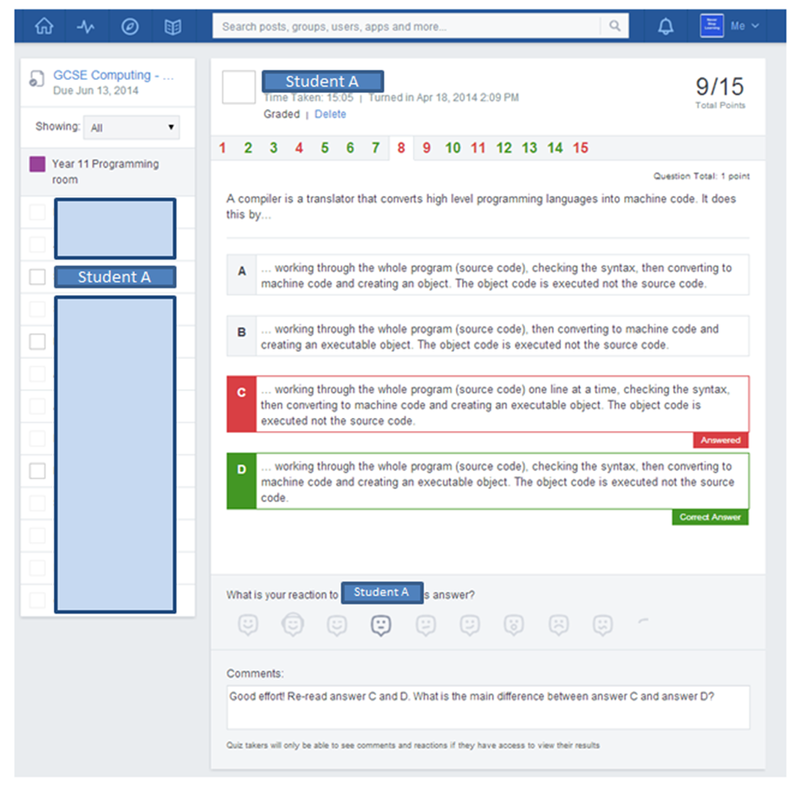 This post will be updated regularly over the next few weeks to cover the OCR GCSE Computing syllabus. The resources can be easily adapted if needed. Feedback welcome! Read more about the approach to revision I’m trialling here.